Seventeen years ago, an eclipse cloaked the kingdom of Relhok in perpetual darkness. In the chaos, an evil chancellor murdered the king and queen and seized their throne. Luna, Relhok’s lost princess, has been hiding in a tower ever since. Luna’s survival depends on the world believing she is dead. But that doesn’t stop Luna from wanting more. 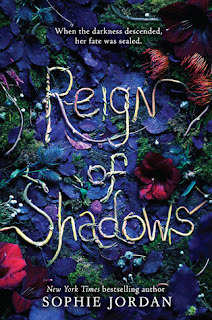 When she meets Fowler, a mysterious archer braving the woods outside her tower, Luna is drawn to him despite the risk. When the tower is attacked, Luna and Fowler escape together. But this world of darkness is more treacherous than Luna ever realized. With every threat stacked against them, Luna and Fowler find solace in each other. But with secrets still unspoken between them, falling in love might be their most dangerous journey yet. 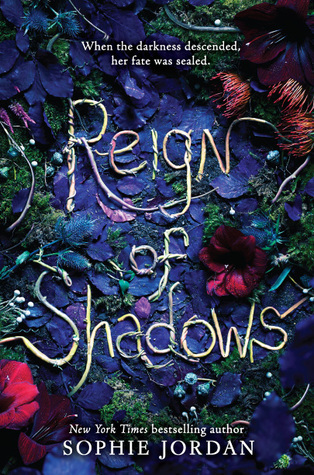 With lush writing and a star–crossed romance, Reign of Shadows is Sophie Jordan at her best. Hehe. Funny story. I DNFed this book the first time I read it. Yeah, I know. I was 23% in and I just wasn't feeling it so I put it to the side and that was it. Fast forward two weeks and I saw some people talking about it, and how they really liked it. So, I figured I might as well give it another shot. I AM SO THANKFUL I DID! The first 40% was a little rocky for me but once I pushed past it I was definitely into the world that Sophie created for her readers. Luna was a likable character, there was an innocence to her because she was locked away in a tower all her life. I didn't love her, but I didn't hate her. I blame her naivety of things on her caretakers because they wouldn't let her out of the castle. The world is cloaked in darkness, and only once a day for an hour there is a little bit of light. In the darkness lurks horrible creatures call Dwellers that feast on the flesh of living creatures. During the light the bury themselves in the ground. But Luna is also blind, which isn't revealed until you're a few chapters in. Personally I think Luna needs a lot of growth as a character, and I am hoping to see that in the next book. When I first read this book I was catching whiff of insta-love and I didn't like that. I think that is what scared me away. But it isn't insta-love. It is more of curiosity and an infatuation with Fowler. Imagine being locked away all your life, never meeting anyone else your age. You would be curious right? I'm thinking it was more that they anything else. I could be totally wrong with that observation though. The world building was well done. Sophie pulled elements from our world, but also created other elements to create post apocalyptic fantasy world. The Dwellers were an interesting concept, an I hope there will be more of them in the next book. Curiosity is making me wonder where they came from. Were they once human? Or something that evolved over time? Another thing I found cool was the bats that now grew to be four feet tall, can you image that? I never knew what to expect in this world next, when I thought it couldn't get stranger it did. Overall I did like this book and will be looking for the next one when it comes available. Sophie leaves the book off with a painful cliffhanger, and after investing a few hours in this world I would really like to see what is going to happen. I'm quite intrigued about this one, but not entirely convinced yet if I want to read it or not... Glad to hear that you really enjoyed it despite the rocky beginning! If you do decide to read it I hope you enjoy it Pili! I am not sure if I want to read it, but I sure like the cover, which is a plus. Thanks for the review!! The cover is stunning, and it makes even more sense once you read. I hope you enjoy it if you do decide to read it! Nice review! I've found this one very intriguing since the first time I heard about it, and I'm happy to see that, despite the rocky beginning, you ended up liking it! I had no clue the protagonist is blind, and that makes me even more interested! But I totally get what you mean when you say you neither loved nor hated her. I feel like that's my opinion on SO MANY characters. Thanks for the review! I was a little taken back by the fact she was blind, it isn't revealed until you are a few chapters in. But it was interesting to see how it played out. Hope you enjoy this one! I understand that. If you do happen to read it I hope you enjoy it!